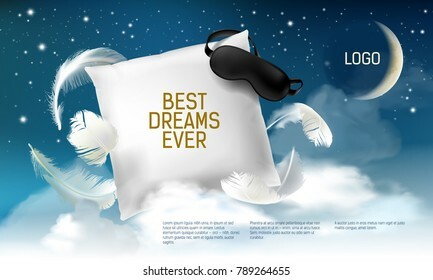 33216 place | Vector illustration in rank M-rank: Vector illustration with realistic 3d square pillow with blindfold on it for the best dreams ever, comfortable sleep. Soft cushion. Relaxation, sleeping concept. Night, clouds, stars background. Vector illustration with realistic 3d square pillow with blindfold on it for the best dreams ever, comfortable sleep. Soft cushion. Relaxation, sleeping concept. Night, clouds, stars background.